Synopsis: On the evening of Sofia Claremont’s seventeenth birthday, she is sucked into a nightmare from which she cannot wake. Review: It took me a long time before reading this novel and I really don’t know why because it’s a fun read. 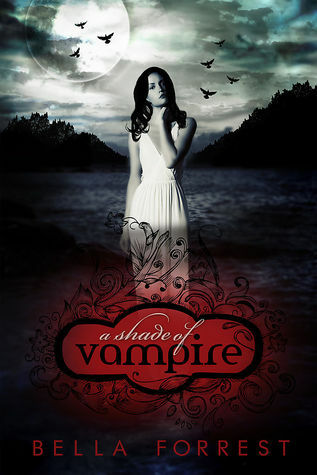 A Shade of Vampires is a very short novel that can be read in a short time but it is also an interesting story, depending on the point of view of two characters. It could be very complex to write about so many delicate subjects such as kidnapping, harems and slaves, yet Bella Forrest was able to write about these problems without going into too much clichés encountered in literature. But what exactly is the story? Sofia is a girl like any others, but after a fight with her best friend, she walked alone in the middle of the night. But her life will change when she meets Lucas, the vampire whose mission is to bring girls to the Prince Derek’s harem. Despite her attempt to escape, and her perpetual anguish, she will get to know Derek and trust him. But can she really? I was surprised by the romance and the plot. The writing is simple and fluid, and it’s why we can read fast enough in the volume. I loved to follow Sofia, even if I have a little trouble to understand her actions and lack of fighting. She gave up too quickly and even if she managed to live, I was expecting more rebellion. However, she is quite courageous, and do not fail to say what she thinks even if she knows that there may be repercussions. Derek is also quite mysterious, he is trying to cling to his lost humanity and so I was quite intrigued by his past. The author has perfectly managed to make us hate Lucas and at the same time, we would like to understand how he became like that. This novel introduces us to new characters but also many problems that I’m sure will become more important in the next volume. I’m pretty curious to see what happens in the following one. I’ve seen a few reviews for this book, and most of the reactions seem pretty mixed–but it still sounds pretty intriguing! I’m glad you enjoyed it overall, Melliane. Oh AimeeKay is reviewing this one and she seemed to enjoy it as well. It seems like a pretty decent start to a series. Glad the romance and plot surprised you in a good way and you enjoyed.